Last night we were on a district assembly in the Poble Sec neighbourhood of Barcelona. Some anarchists were also taking part in the assembly. 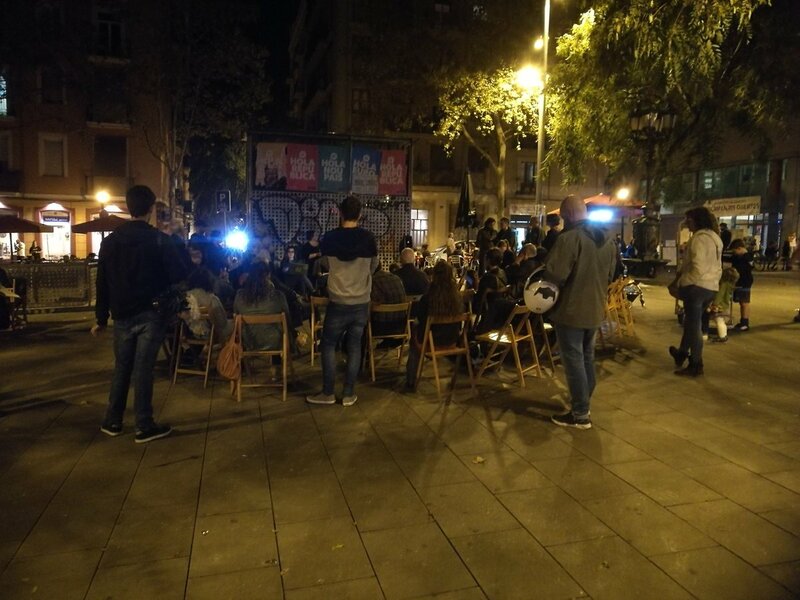 Image: District assembly in the Poble Sec neighbourhood in Barcelona on October 20, 2017. Last night we were on a district assembly in the Poble Sec neighbourhood of Barcelona. Some anarchists were also taking part in the assembly. It was an assembly of the so-called neighbourhood defense committee and it reminded us of the 15m assemblies we visited a few years ago in different cities on the Spanish territory. We published a lot of reports, essays, letters and statements from anarchists about the situation in Catalonia, many of them, including our own statement, opposing the idea of another state. The majority of people who spoke at last nights assembly where women and it was a discussion free of hierarchies. People spoke about what they expect to happen in the coming days and how to push the independence process. For us it wasn’t an easy discussion. To visit an assembly of an indepence movement, while we consider states as part of the problem, isn’t an easy thing to do. But we want to follow and document the independence process. Most anarchist comrades we personally know in Catalonia oppose the idea of a Catalonian state. But they also told us that there are also anarchists that support the independence process. After the assembly we had a discussion with an anarchist comrade who took part in the assembly. She told us that they call themselves “Independentistas” and for her the process is to breakaway from Spain. She said that she is not fighting for another state, but to weaken the central Spanish state. The idea is that as soon as Catalonia breaks away, other regions like for instance the Basque country sooner or later will follow. In the end one of the biggest EU member states would break apart. There are many different factions and the comrade we spoke with said she doesn’t support Puigdemont and his Catalan government. She also said that the process is far from over when Catalonia would become an independent state. In the assemblies people are often talking about how to build up Catalonia from below. Yesterday people discussed a manifest were they are working on. For many people this process is not about a new ethnic state, the comrade we spoke with wasn’t even born in Catalonia or Spain. People aren’t naive, they are aware of the fact that many people in Catalonia who are supporting the independence movement have different goals. Many people just want a Catalonian capitalist state, not only a majority of the political parties who are in favour of a new Catalonian state (only CUP is a leftwing anti-capitalisitc party), but also parts of the movement. The comrade we spoke with said, that this is one of the reasons for her why self-organization in the neighbourhoods have absolute priority. The organization from below, where social struggle is also an important issue. For her its not a goal to create a new state, but abolishing the central Spanish state is part of a bigger goal and just a point on a long road towards total liberation. Like we wrote before; we are not very optimistic about that and we are affraid that the Catalan bourgeoisie will turn against them when they are not needed anymore. But we do respect the intentions of comrades who support the independence process out of this kind of anarchist motivations. Even when we will continue our way and will not support the creation of any new states, we hope the comrades who support the Catalan process proof us that we were wrong. Time will tell how the situation in Catalonia will develope. In solidarity, Some of the Enough is Enough team, October 21, 2017. We are in Barcelona again. Please continue to support our independent on the ground reports. Its your support that makes it possible. Reblogged this on Subversion #1312. Totally agree with the sentiment that independence weakens the state. While recognising the desirability of no state, it seems purist or black/white to think that decentralised states aren’t a better outcome than keeping the large centralised states/multistate institutions. For one, their resources to suppress/oppress/control their populations are less, their ability to project power overseas diminished etc.